The Blues are likely to pursue another wide attacker in the summer with Eden Hazard said to be angling towards a potential move to Real Madrid. According to Suddeutsche Zeitung, the west London side are keeping a close watch on the performances of Ziyech, who has been one of the standout players for Ajax in their stellar Champions League campaign. Ziyech has already contributed 17 goals and 14 assists in the Eredivisie and Champions League this term, and he is likely to be the subject of a transfer tussle with Arsenal and Bayern Munich also in the running for his services. 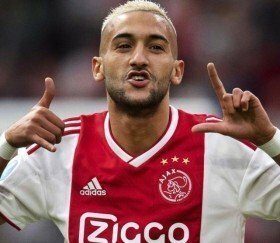 Ziyech, who represents Morocco at the international level, is valued at around £30m. He recently grabbed an assist in Ajax's stunning 2-1 triumph over Juventus which ousted the latter from the Champions League at the quarter-final stage.